I am writing to share my thoughts on the Way of Selflessness Distance Studies Course in hopes that others might be encouraged to participate. It would be great to report that there has been a Gnostic Awakening on my part as a result of the Distance Studies Course. That is not the case. Gnostic flashes and episodes for sure. I can say with certainly that many of the entanglements of self have loosened substantially, resulting in a much more fluid flow to life. I strongly feel that, given the right effort and grace, a full Awakening is possible with the guidance received in the Distance Studies Course. Over a thirty-year period of seeking I tried many avenues before finding Joel’s book and CSS. From my perspective this method resonates deeper than any of the other approaches. I have no recollection of how I first stumbled onto Joel’s books, but after reading The Way of Selflessness I knew there was the ring of truth to his teaching. I had a thirty-year, off and on, history of seeking behind me and was familiar with many of the basic concepts in the book. Joel’s approach of bringing the perennial teachings of many of the religions and philosophies to light was a new and welcome approach. I had always wondered why we tended to focus attention on differences rather than common threads. There is an ease toward life which was not present prior to engaging in the Distance Studies Course. But, as I said, so many of the self-referencing mental elements still lurk... Leaving only one alternative: to press on. There’s clearly no going back. After going through the book in a somewhat haphazard way I went to the CCS website and listened to a number of Joel’s talks. I saw that a distance studies course was offered. I signed up and was given Fred as my guide. I’ve spent 6 years off-and-on corresponding with Fred. He has always been very patient. I have completed the book and audios a couple of times because there was the urge to go back and revisit different elements. One thing that has been crystal clear throughout this process is the seemingly endless ways self-centered thought and action manifests, some being incredibly subtle. Last fall it didn’t seem like there was anywhere else to go with it. Fred suggested I come out for the spring retreat, which I did. It was nice to meet with Fred, Joel and all the other CSS sangha members I had read so much about. Reading all the Awakening accounts of different CSS teachers, it’s clear that while I’ve had some fairly intense shifts, there is not the unmistakable sense that seeking is over. Fred advised that if there is a feeling of unfinished business it would be best to keep practicing. There is an ease toward life which was not present prior to engaging in the Distance Studies Course. But, as I said, so many of the self-referencing mental elements still lurk, even though they are most often viewed as part of an unfolding story. I remember Joel referencing a stage where ordinary life no longer dangles the carrot of promised satisfaction but the spiritual life has not blossomed to full clarity. That seems to be true of this experience. Leaving only one alternative: to press on. There’s clearly no going back. A final point I feel compelled to make is unless you are truly driven to this path, I would not recommend it. I have said to Fred many times that I feel like I’m on a high railroad bridge over a deep ravine and there are trains coming from both directions. Prof. Huston Smith died peacefully at his home on Dec. 30, 2016, at age 97. He devoted his long and admirable personal and professional life to living and communicating to others the teachings of the religions of the world. Although a lifelong Methodist, he also practiced Zen, Sufism, and Vedanta. His books and lectures are exceptionally lucid. Personally, he embodied the qualities of kindness, wisdom, clarity, and joy. We were blessed to have him among us. 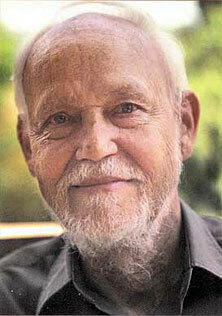 To read more about his life, see the obituary of Huston Smith at HuffPost. For some reviews of books by and about Huston Smith, see the CSS Library Blog. With his inspired and lucid style, the modern master of world religions exposes the cause of our modern global crisis: the modern worldview of scientism which marginalizes the religious dimensions of reality. Smith then makes a passionate plea for the revival of the religious dimension of life — in individuals, in societies, and in civilizations. With engaging personal experiences and insights drawn from a lifetime of interaction with leading religious, philosophical, and scientific thinkers, Smith illustrates how the tunnel vision of scientism pervades scientific, political, educational, and media sectors of our society to the point that we do not even see our blindness. Smith sees light at the end of the tunnel, however. His vision for the third millennium is to combine the best of modernism (science) and postmodernism (social justice) with the traditional worldview shared by the world's religions. Like the Center's "Challenge and Response," Smith's book provides us with a clear guide for responding to the challenges of our times based on a deep understanding of why religion matters. 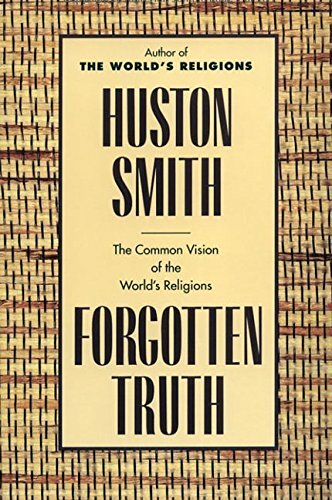 Huston Smith's first book, The World's Religions, was for several decades a classic text in world religion courses at American universities. It presents the diverse major world religions individually. It then took Smith twenty more years to see how these religions converge. Forgotten Truth presents that vision. One of his major theses is that there is an "invisible geometry" behind the diverse traditional worldviews of human cultures, all of which were based upon a religious cosmology. Just as our various human bodies share the same skeletal structure, these various worldviews share a hidden unity beneath their apparent differences, a "human unanimity." Except for the modern Western worldview, that is. Due to the materialistic interpretation of science, the worldview of the West became an anomaly, a radical break from the basic structure of the human unanimity. Smith does not argue that the traditional worldviews were, or are, completely valid. Indeed, many aspects of them, such as their claims about the natural world, are now obsolete. But the materialistic worldview is no longer consistent with science itself. Now, Smith argues, the time is ripe to correct this mistake. It is a basic thesis of the book that the "invisible geometry" can help us create a viable worldview.